Back in Ireland after a week away in Orlando to take in MEC, the “forgotten conference”, I’ve had time to digest some of what happened in Florida and reflect on some topics that I didn’t get to cover in previous posts from MEC. It was great to be at an event where “community” was as important as the formal conference sessions. Evidence of engagement was easily seen any time you went by the whiteboard areas in the exhibit hall, especially the area close to where the MVPs hung out (well done to Stacey Yen, Melissa Travers, and their colleagues). I think that Brian Winstead’s report over-estimated the number of Exchange MVPs who attended MEC at “more than 50”. After all, depending on the point in the award cycle, there are only 91 Exchange MVPs worldwide (the MVP site lists 89 current Exchange MVPs who have agreed to publicize their status) and many did not make it to Orlando due to other commitments. Amongst those who did that I had never met before was Glen Scales, master of EWS. I had no chance of recognizing Glen without his floppy Aussie hat! 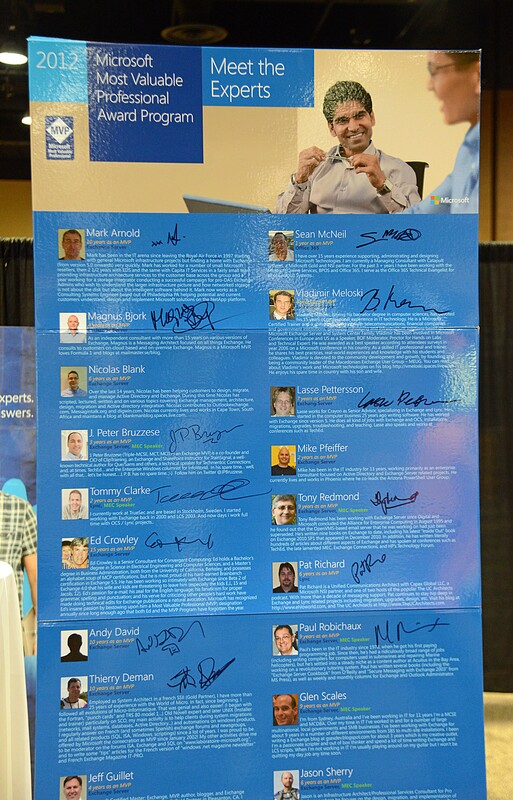 Overall, my estimate is that there were perhaps 25-30 MVPs at the event, some of whom have earned their recognition by working with other products such as Lync. About 20 MVPs featured on the “Hall of Fame” shown here. The higher number reported by Brian might be accounted for if you include the Microsoft Certified Masters (MCMs). In any case, the MVPs were obvious, engaged with attendees, and many of the attendees had good fun tracking down the MVPs to get autographs on the shirts distributed by eNow Consulting. Congratulations to James Matteson for winning the Microsoft Surface. It was nice to run into people who make very worthwhile contributions to the Exchange community on an ongoing basis. Among these are the “UC Architects”, a group including Pat Richard, Steve Goodman, John Cook, Dave Stork, Michel de Rooij, Johan Weldhuis, Michael Van Horenbeeck, and Serkan Varoglu, who collectively do a nice job of putting together a regular podcast covering items of interest to the Exchange and Unified Communications community. The photo shows some of the UC Architects at MEC with Perry Clarke, fresh from his “geek out” keynote session. The latest UC Architects episode (number 8) covers the demise of TMG and other Microsoft on-premises security products. Recommended! In previous posts I made the point that the Exchange developers were very available at MEC. In fact, the engineers who were there organized and delivered a “tell it all – the unvarnished truth” session in the last speaking slot. I missed this session because I was speaking at the same time. I wish I had been able to attend as a session that promises to explain why marketing and product management don’t always tell the truth would have been compelling listening. I hope that Microsoft includes a similar session at the next MEC.Perhaps this time it will receive more publicity. Brett Shirley was one of the engineers at the “tell-all” session. Brett has a most unusual dress style and is renowned for the sartorial dash that he cuts at events. My eyes are still smarting from looking at the flowery overalls that Brett wore when giving an ESE Internals session at TEC in San Diego last May and I heard (but sadly did not see) that other fashion highlights were revealed by Brett at MEC. But Brett did leave his mark in other ways, not least because he was the engineer who offered to check the Exchange source code on his laptop to resolve a question raised at a session. Super response to any technical question! Scott Schnoll is one of the popular speakers on the conference circuit. Before MEC, Scott was at TechEd Australia and TechEd New Zealand. You can read his thoughts on changes in Exchange 2013 in an interview given when Scott was down under. It doesn’t quite measure up to listening to Scott in person, but the interview does cover some of the material he presented at MEC. On another note altogether, I liked the New York Times article about Meg Whitman’s challenge at HP. It seemed to hit all the problem areas that afflict the Palo Alto company. It’s hard to turn a company the size of HP to cope with the demands of a time when PCs aren’t so important and cloud services are changing the server market. Time will tell whether she succeeds. I hope that she does. This entry was posted in Cloud, Exchange, Exchange 2010 and tagged Exchange 2013, MEC, Microsoft Exchange Conference, UC Architects. Bookmark the permalink.